There are a few things in life that get me swearing like a truck driver from Rimouski, pondering the finer things in life. And ever since I relocated to Toronto, I miss certain comfort foods from my past more then I thought I would. Bagels. Poutine. Blanche de Chambly. Very carbohydrate intensive indulgences – and my waistline certainly reflects these indulgences. It’s not my fault. I lived in Montreal for most of my life, and certain deliciously cheap indulgences were abundant. Street meat in Toronto scares me when I’m sober, and reminds me not to eat meat from a sink-free source. During the recent G20 riots, we ventured into the downtown core, away from the protesters and vandals (and yes – there is a difference, but I’m not going to preach about these situations). We visited a few art galleries on West Queen St. West in the pouring rain, and walked back up to the Bloor-Danforth line after mass transit in the downtown core shut down for a weekend of mayhem. My other half suggested poutine. We debated going to Smoke’s Poutinerie, but I found their menu too extensive for a poutine joint. 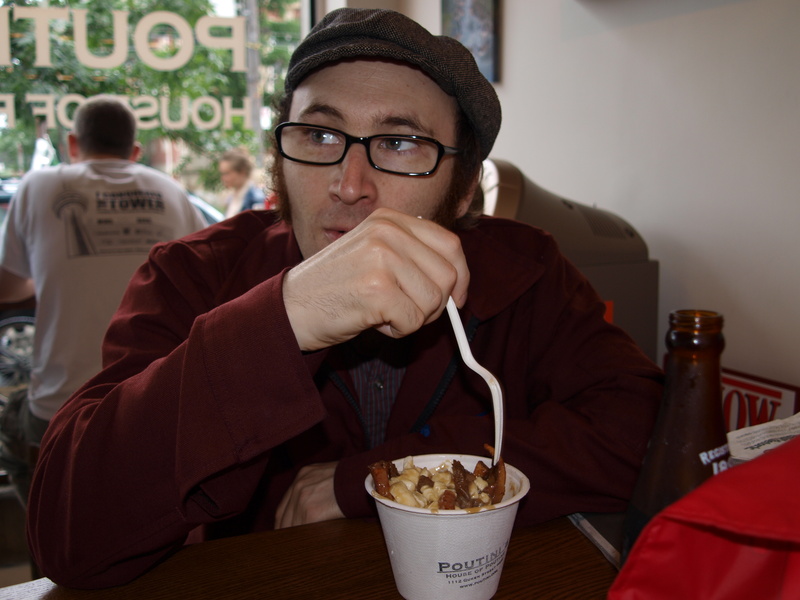 We weighed going to Poutini’s, as they have a vegetarian gravy that my other half could eat. We decided on Poutini’s. The curds were squeaky. I had high hopes. 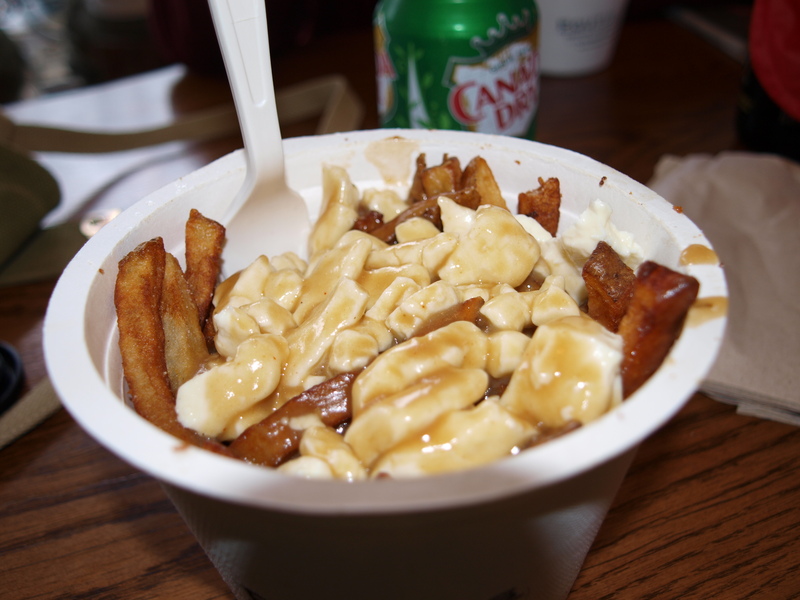 Curds squeak if they haven’t been refrigerated, and they are very important to the proper poutine. But that blasphemy was not worth the 190980 calories and 373773 grams of fat, not to mention the month it shaved off of my life. The gravy lacked the certain je ne sais pas that I am accustomed to. It was thin, flavourless, and the wrong shade of heart attack inducing brown. And at almost $10 for a “regular” size bowl and a liqueur, I felt the heart attack coming on. Too bad OHIP doesn’t kick in for another month or so. Zut alors. Some things are better left as happy memories, instead of trying to relive the culinary mishaps of your youth. I guess I’ve eaten my fair share of poutine, and it’s time to move on. AYCE sushi, here I come. This entry was posted in Uncategorized by hoboshutterbug. Bookmark the permalink. OH MY GOD NO BEARD. Seriously though, if you’ve never been to Gandhi’s on Queen Street West just east of Bathurst, go! I’ll put Gandhi’s on my list of places to visit. There’s a cardiac limit to how often I can eat poutine. And he’s been sexily beardless since August now. 😀 I won! Oh, no, no – it’s not a poutine place. Indian roti. Delicious, delicious, massive Indian dishes wrapped up in spongy bread for cheap!